Guangdong, China, May 2nd 2017 – Midea (Midea Group Co. Ltd, SZSE 000333), a leading global player in consumer appliances, Heating, Ventilation and Air-Conditioning (HVAC) systems, Robot, and Industrial automation systems, has signed an agreement with Electrolux to establish a long-term strategic joint venture in China to promote and distribute the premium German brand AEG appliances for Chinese customers. 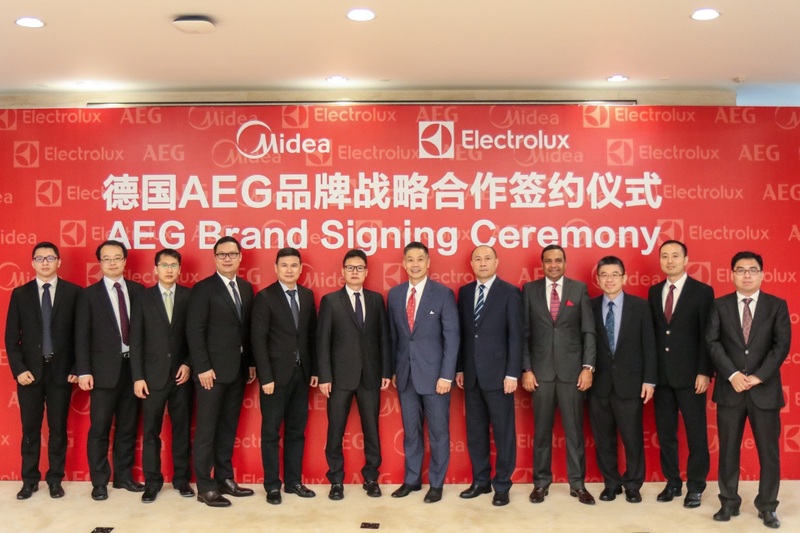 This partnership, majority owned by Midea, will build on the strengths of both Midea and Electrolux to explore the rapidly growing Chinese premium markets for both B2C and B2B segments: AEG brand will benefit from Electrolux’s brand expertise while Midea will provide unparalleled market access and consumer insights. “We are indeed excited about this partnership with Midea. Coupled with the strengths of our esteemed organizations, this strategic joint venture will not only provide Chinese consumers with best-in-class premium product offerings and experience but further cement Electrolux’s commitment to growing our business and the AEG brand in China,” said Ken Ng, Executive Vice President and Head of Electrolux Major Appliances Asia Pacific. The transaction will be subject to regulatory approvals. AEG is a leading brand of premium household appliances, with innovations designed to give consumers the ultimate sense of mastery in their homes. Combining intelligent technology and responsive design to achieve exceptional results, AEG’s promise is to be “Always an idea ahead.” Founded in Germany, AEG has been pioneering ground-breaking consumer products for more than 130 years and is today part of the global Electrolux Group. Midea is a leading global player in consumer appliances, Heating, Ventilation and Air-Conditioning (HVAC) systems, Robot, and Industrial automation systems. Midea is committed to build a better life by adhering to the principle of “Creating Value for Customers”. Midea has now established a global platform of more than 200 subsidiaries, 60 overseas branches and 10 strategic business units. Midea is also the principal shareholder of KUKA with controlling nearly 95% stock. In 2016, Midea ranked 481 in Fortune Global 500, with revenue of RMB 159.0 billion and nearly 130,000 employees. Midea is listed on China’s Shenzhen Stock Exchange (000333.SZ). Electrolux is a global leader in home appliances and appliances for professional use, based on deep consumer insight. We offer thoughtfully designed, innovative and sustainable solutions, developed in close collaboration with professional users. The products include refrigerators, ovens, cookers, hobs, dishwashers, washing machines, vacuum cleaners, air conditioners and small domestic appliances. Under esteemed brands including Electrolux, AEG, Zanussi, Frigidaire and Electrolux Grand Cuisine, the Group sells more than 60 million products to customers in more than 150 markets every year. In 2016 Electrolux had sales of SEK 121 billion and 55,000 employees. For more information, please visit www.electroluxgroup.com.